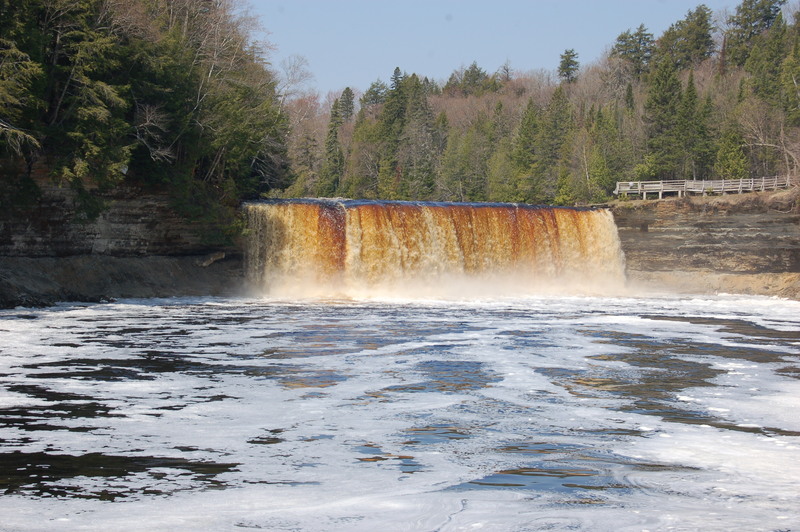 Few Upper Peninsula State Parks draw visitors in droves each summer the way Tahquamenon Falls State Park does. 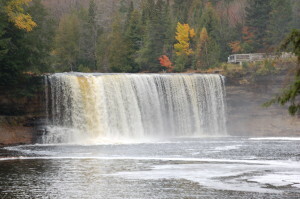 We used an earlier post to highlight the Lower Falls and how you can get up close to the scenic waterfalls there by renting a rowboat, but today we focus on Michigan’s most famous and largest waterfall – Upper Tahquamenon Falls. 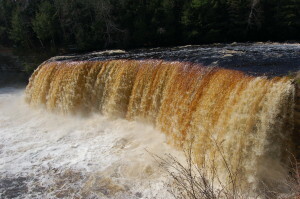 With a drop of nearly 50 feet and a width around 300 feet at its crest, this is not only the largest waterfall in the Mitten State but also the second-largest east of the Mississippi (Niagara Falls in New York/Ontario is the largest). 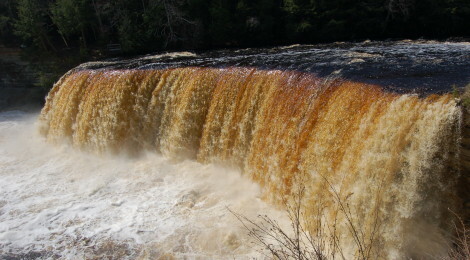 Immortalized in literature by Henry Wadsworth Longfellow in The Song of Hiawatha and in song by Sufjan Stevens (“Tahquamenon Falls” from the album Michigan), this waterfall has intrigued visitors for years with its copper-colored waters that are a result of tannins found in the cedar swamps that drain into the river. 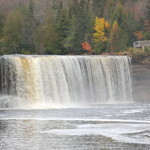 Check out our photo gallery of the park for more great views! 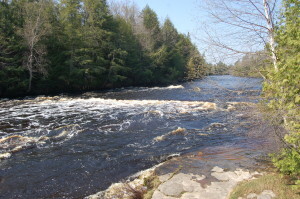 The beauty of the state park here is that the trails are paved and wide, and fully handicap accessible to a point. There is a lot to see as you work your way through a forest, and informational signs highlight types of trees, wildlife information and more. 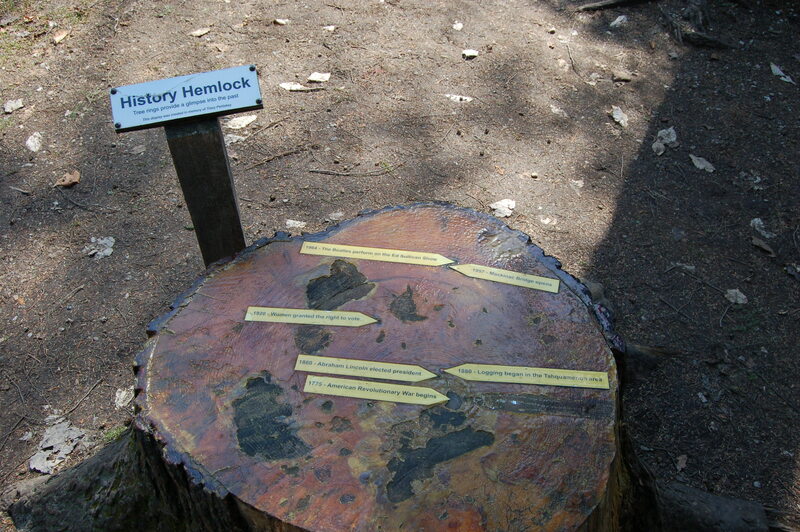 The tree shown above has notes on the rings that show how old the tree itself is and how big it was when historical events like the Revolutionary War or The Beatles playing on the Ed Sullivan Show took place. 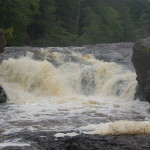 To get to the brink of the falls, take a right when the trail forks. 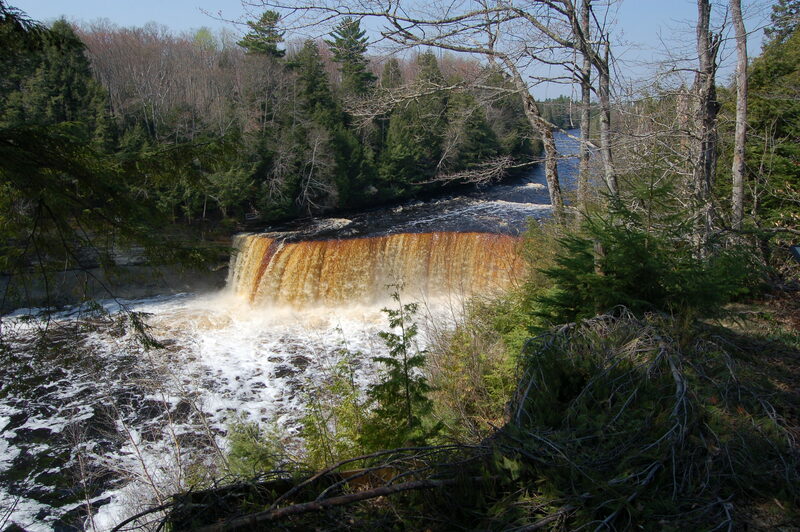 Your first view of the falls is partially obscured by trees, but still provides a powerful view. The trail to the falls is about a quarter mile total, and 94 steps complete the journey down to a large viewing platform at the top of the falls. 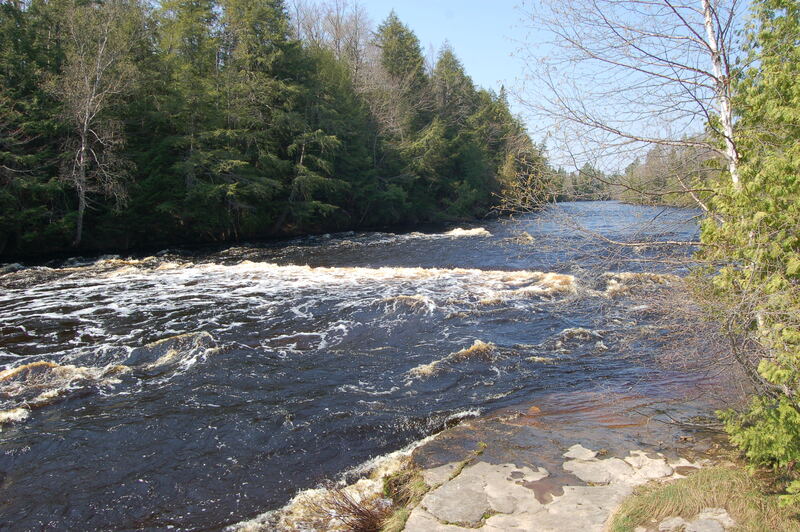 Below is a picture from that vantage point, as well as a look at what the river looks like upstream. When heading back towards the parking lot, consider taking the fork that leads down into the gorge before you leave, as the view from down there is quite different and gives a better idea how wide the falls are and how big the drop is. 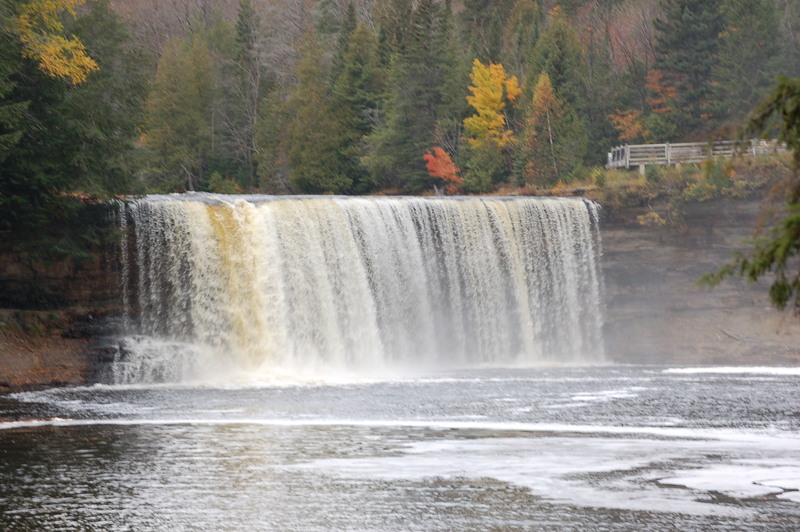 There are more than 100 steps involved in this trip, so keep in mind that it may be tough for some. Finally, a short nature trail is another great side trip to take on the way back to the parking lot. 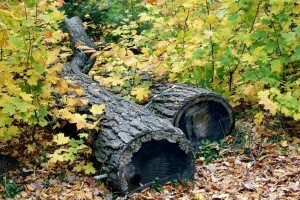 Small wildlife is abundant in this area, and in the fall the scenery is absolutely fantastic. 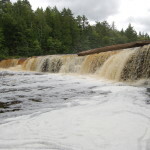 The trail is smooth and mostly flat, but can present a few challenges with standing water in the spring months or after a heavy rain. The complex next to the parking lot provides even more ways to enjoy your trip. 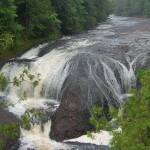 Stop in to the gift shop or have a meal and a few brews at Tahquamenon Falls Brewery and Pub. This part of the park has the rustic feel of an old logging camp, just like the ones that occupied this area many years ago.